UPDATE: Click here for information on the 2017 Amalfi Coast ferry schedule. While the twisty Amalfi Coast Road is justifiably famous, my favorite way to get around is on the ferry. You get to avoid the traffic and all those curves while at the same time getting a first class view of the coastline from the sea. I receive a lot of questions about using the ferries on the Amalfi Coast, so I’ll cover as many as I can here for the 2016 season. Where do ferries depart for the Amalfi Coast? The most extensive ferry service on the Amalfi Coast is run by Travelmar, with a line that connects Salerno, Amalfi and Positano. They also feature a service that connects Maiori and Minori with Amalfi. The company Gescab offers ferry service connecting Amalfi and Positano from Capri. Sometimes during peak summer season there is ferry service to the Amalfi Coast from Sorrento. It was offered in 2016, but I will update this post when I find out 100% that there is ferry service from Sorrento for this season. Where do the ferries stop on the Amalfi Coast? Ferry service on the Amalfi Coast is primarily focused on Amalfi and Positano. 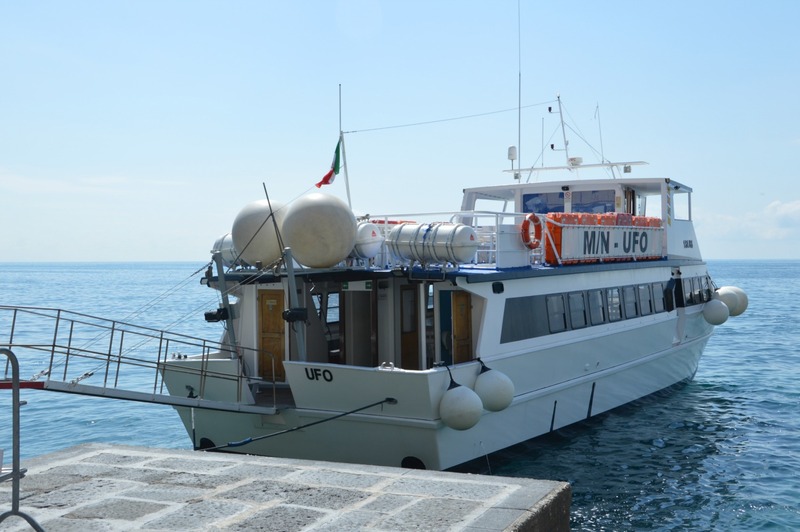 However, there is also a smaller boat service between Maiori and Minori to Amalfi so travelers can connect to other boats to reach Positano, Salerno and Capri. When do the ferries run on the Amalfi Coast? There aren’t set dates for the ferry boat service along the Amalfi Coast each year. There are some general guidelines, but they are weather dependent. 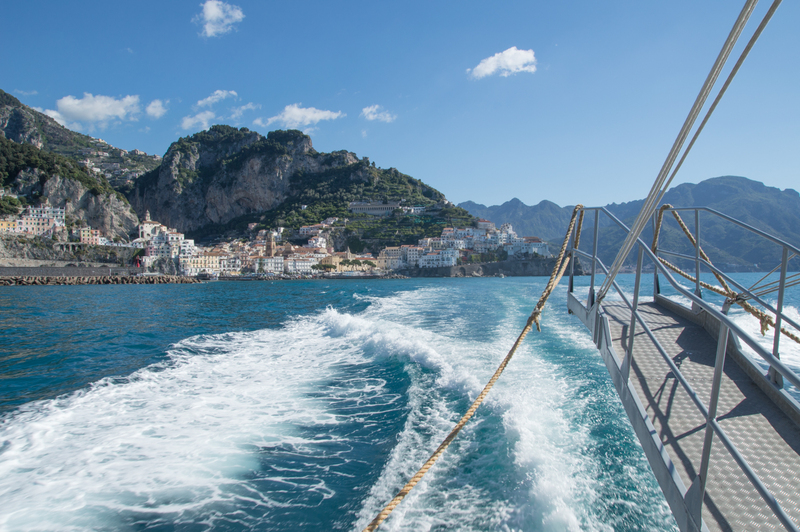 Ferry service usually begins on the Amalfi Coast each year in time for Easter, which kicks off the tourist season. Services run through the autumn until the end of October or beginning of November, depending on how long good weather holds out. If you’re planning on visiting in the early spring or late autumn, it’s best to have a plan B in case the ferries aren’t running due to rough seas or bad weather. 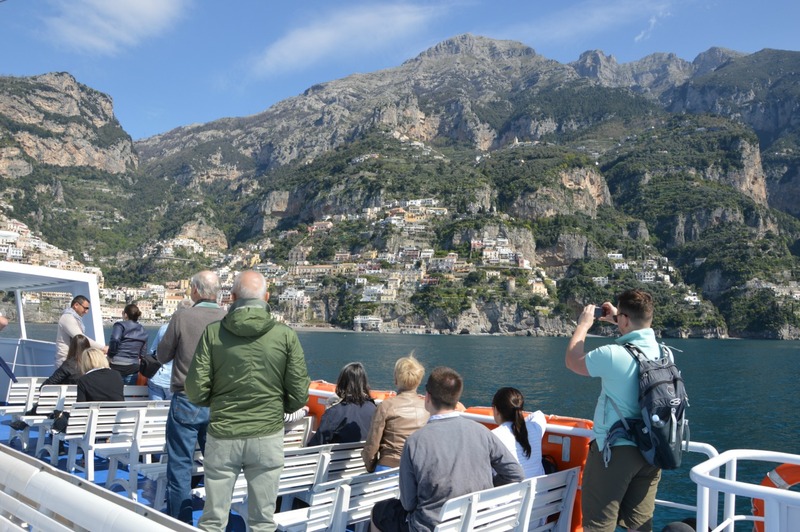 What is the ferry schedule on the Amalfi Coast? The Travelmar website is available in English and you can check out the ferry schedule here. They also have an app linked to from their website that you can download in advance. Gescab has their schedule for ferry service between Salerno, Amalfi, Positano and Capri here. 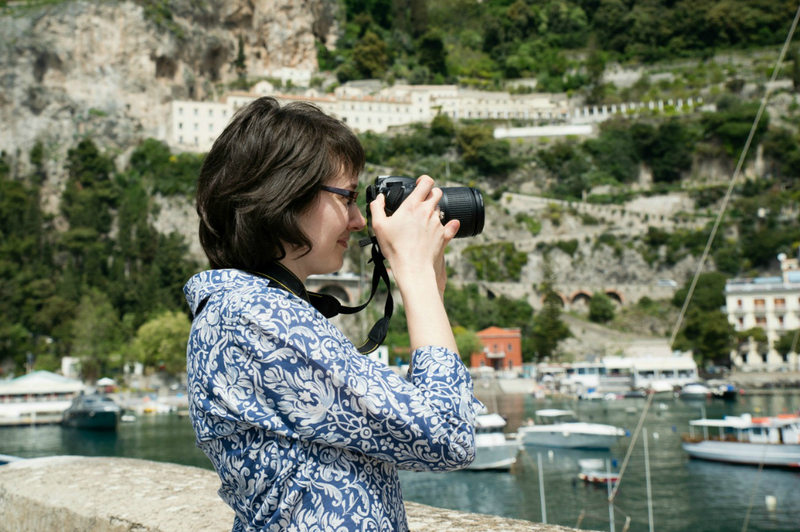 How much does the ferry cost on the Amalfi Coast? Prices vary depending on the length of your journey and the company. In general, on Travelmar the prices are €8.00 per person between Amalfi and Positano and a bit more from Salerno all the way to Positano. You can find all the Travelmar rates here. Can I buy ferry tickets in advance on the Amalfi Coast? Yes! Both Travelmar and Gescab offer online ticketing in advance via their respective websites. You can also book in advance on the Travelmar app. Where is the best place to sit on the ferry? Is it a problem to take luggage on the ferry? Not at all! Many people do. Just be aware that you might need to pay a small extra fee for each piece of large luggage and you’re responsible for lugging it on and off the boat. Can I take a ferry to Ravello? Well, you’d have to catch the special flying ferry to reach Ravello, because it’s situated about 1,200 feet above sea level. But, no worries, you can simply take the ferry to Amalfi and then continue up into the mountains to Ravello via bus or taxi. Alright that last question was just for fun. (Although I have actually been asked that numerous times!) Are there any other questions about taking the ferry on the Amalfi Coast that I’ve missed? Yes, it is just incredible to see this coastline from the water! I remember the first time I took a ferry that landed in Sorrento, I surprised myself with the strains of “Torna a Surriento” welling up in my head. As many times as I’d heard the song before, I couldn’t believe the impact of seeing the coastline and in an instance I really understood the significance of that beautiful piece of music. I loved reading about your experience taking the ferry to Sorrento, Karen. Thanks so much for sharing! It really does bring the emotions in that song to life. Wonderfully informative post and gorgeous photos. Thank you so much for sharing and warm greetings from Montreal, Canada. Thank you so much, Linda! I’m really pleased the post was helpful for you. Greetings right back to you in Canada! Firstly, your page is really helpful – thank you! I have a question which I’m hoping you might be able to answer. We are visiting the Amalfi Coast in June 2016 and will be arriving into Salerno by train, and then staying in Amalfi, Positano and Sorrento. I can book the ferries between Salerno and Amalfi, and Amalif and Positano on travelmar, but I am struggling to find a ferry between Positano and Sorrento. We will be doing the journey between Positano and Sorrento on 8th June – do you know if there is a ferry service running on this date? Hi Trudi, I apologize for not responding sooner, but I didn’t have any updated information until just today when my husband handed me information about the Sorrento, Amalfi and Positano ferry service this year. The company is NLG and their website is http://www.navlib.it. I do hope you were able to arrange the ferry service and that you had a wonderful visit! Hi Lesley, There is a ferry service from Amalfi to Ischia during the peak period of the summer. Once I find out more details I will post an update! Hi Lesley, I just spotted that Alicost started up their ferry service between Amalfi and Ischia yesterday – June 15th. Not sure if you’re still in the area or not, but you can find out the details on the Alicost website here. Thanks for all the great information. Just wondering if it’s possible to get to Ischia by ferry from Amalfi? Can’t believe we’ll be in Amalfi next Sunday! Hi Paul, It is possible to get to Ischia from Amalfi by ferry, but usually only during the peak season – so often only in July and August. But do check and hopefully the service will be running. Have a wonderful time! HI, how far away is the train station in Salerno from the ferry port? Also, what is there to do in salerno while you’re waiting for the boat? Great post, Laura! Thanks so much for the updated 2016 info! I too enjoyed the views of the spectacular Amalfi Coast from the water! Need your expert tips for my first time Italian experience. I’m planning to have a short trip to Positano and Capri in mid-July. My plan is to take train from Rome to Salerno. From there we will take the ferry to Amalfi walk around and hop again to Positano for a night. Is Hotel Poseidon good? The next day after check out we will take ferry to Capri (stay one night maybe) and ferry to Sorrento the next day. Onwards to Pompeii via train walkabout and continue to Naples before we head back to Rome. Is it better to take train or hire a taxi for this last leg? Maybe I might be over achieving in covering the places do you think it’s doable for 2 days? Hope you can share some thoughts! Thank you. Great page, this helped me a lot and will be booking our ferry from Positano to Salerno from the sites you recommended ahead of our trip in a week! I wondered if you might be able to advise whether booking a ferry from Sorrento to Positano is easy enough to do when we’re there, or should we pre-book? If so, can you recommend a website to do so? 1. Is it difficult to get down to the ferry with luggage? Are there any stairs or do you need to cross the beach to get to it? I will have my elderly mother with me. She is fit but our luggage may be heavy. 2. Will the ferry operate on 10 October, 2016 from Positano to Capri? Who operates it? Positano is definitely a lot of steps and inclined walking. You might be able to get assistance with luggage from your hotel, but I’m not sure on that. When you get down to the beach level, it’s mostly flat along the sidewalk to the pier (but there are some steps). Weather permitting the ferries should be running on October 10th. 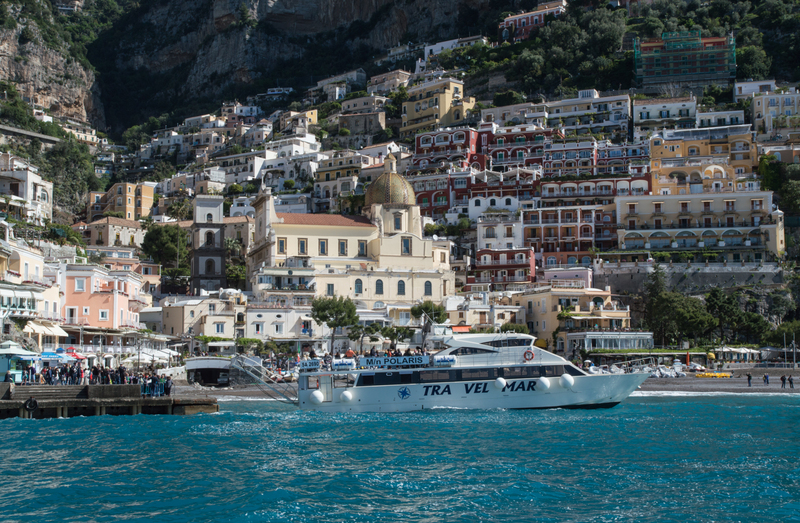 You can take either the Positano Jet or the ferries run by Navlib that connect Salerno-Amalfi-Positano-Capri. Tickets are purchased down on the pier where the ferries pick up and drop off. Have a wonderful time! We’ll be travelling from Rome to Praiano on August 12 and was thinking about taking the Marozzi bus at Tiburtina to Praiano. Probably slightly longer ride but less of a hassle than taking train to Salerno, ferry to Amalfi and then another ferry or bus to Praiano. What do you think about the Marozzi bus? Would you know the approximate cost of taxi ride from Praiano to Amalfi? Hi Maria, I’m not familiar with the Marozzi bus at all, but if it gives you the chance to get off at Praiano then it does sound easier than mixing buses and trains and ferries. Taxis are VERY expensive on the Amalfi Coast. I couldn’t give you an estimate, but I’d guess over €50 for sure and probably more. They function more like transfers than taxis in a city. Hope that helps! Hi Laura! Just an update on our trip Rome-Praiano using the Marozzi bus: it was amazing and very convenient. The view was spectacular, bus ran on schedule also. We are in Praiano now and it is as beautiful as they say! Thanks for your blog and your great tips! That’s wonderful! Thanks so much for the update, Maria. I hope your time in Praiano was wonderful! Thank you Laura for another brilliant Ciao Amalfi newsletter, we have visited the Amalfi coast many times we always keep in touch with what’s going on from our friend in Pogerola, Amalfi! and of course receiving your newsletter is such a great read, always something new, the region has so much to offer, so nicely written you have a real talent. This year we visit Amalfi coast in October, have always said we should visit Ischia and believe the ferry in October would run from Naples, we also plan to take a trip to Cetara and like all the region so unspoilt and the scenery stunning. Thanks so much for writing this blog! It is very helpful and enjoyable to read. Very happy to hear it was enjoyable and helpful, Lauren! Love your site Laura, this is the most helpful resource in hearing info from someone who’s there! I’m hoping you might have some wisdom on luggage storage in Positano too. We’re catching a ferry in from Capri, spending a few hours in Positano and then catching bus & taxi to Ravello. While we’re in Positano, is there anywhere official (or at least secure) near the ferry we can leave a suitcase and a couple of bags? Hi Alex, hum … that’s a good question! Getting around Positano with luggage is definitely not a tremendous amount of fun. You will have to haul it up to the top of the town just to catch the bus, which is already an endeavor. I don’t know of any place that does luggage storage in Positano unfortunately. Is that your only chance to visit Positano? Or could you consider staying on the ferry to Amalfi where it’s easier (flat!) to catch the bus or taxi to Ravello and then visiting Positano another day without the worry of luggage? This is my first exposure to your post. I am learning a lot! this will be our first trip to Italy. My question: We want to take the early bus from Sorrento to Amalfi on Sun, Oct 16, and that appears doable. We don’t know what the return bus schedule is..I am only seeing a late return (5PM) on the Sita published schedule—did I read that correctly? We need to return to Naples to catch a train to Rome for a lodging check-in by 7:30PM. That does not appear to be enough time to make the check-in time. Hence, we think taking a ferry from Amalfi to Sorrento or Naples makes more sense. What do you recommend we take to make sure we are at the Naples train station by 3:30PM? I’m planning on catching the the first ferry from Positano to Salerno. It’s scheduled to arrive at the Concordia port at 11:15am. I have a train at 11:38am. Is that enough time to make the connection? Hi Chad, Well, I like to travel with quite a bit more time since just reading that schedule made me feel tense. 🙂 But if everything runs on time and you don’t mind hustling from the port to the train station it could work. What kind of train tickets do you have? Do they offer any flexibility in case you need to catch a later train? Hi Laura! I’ve just discovered your site and am looking forward to reading more – it seems like a great resource! I’m going to be traveling in late October and it looks like the Navlib ferries end service by mid-October. Are there other options? Thanks! Hi Brenda! I’m so happy you discovered Ciao Amalfi. Thanks for stopping by and for commenting. Yeah, it doesn’t surprise me to hear that Navlib services might be ending mid-October. Are you looking at arriving from Sorrento or Naples? The Travelmar ferries along the Amalfi Coast will be running as long as the weather is nice – usually through the first 4-5 days of November if possible since November 1-2 are a holiday here. But they have to stop running when the sea is rough. Thanks! Current plan is Naples to Sorrento via Alilauro. Will stay in Sorrento a couple days. And I’m still working on Sorrento to Positano, but Alilauro shows options. 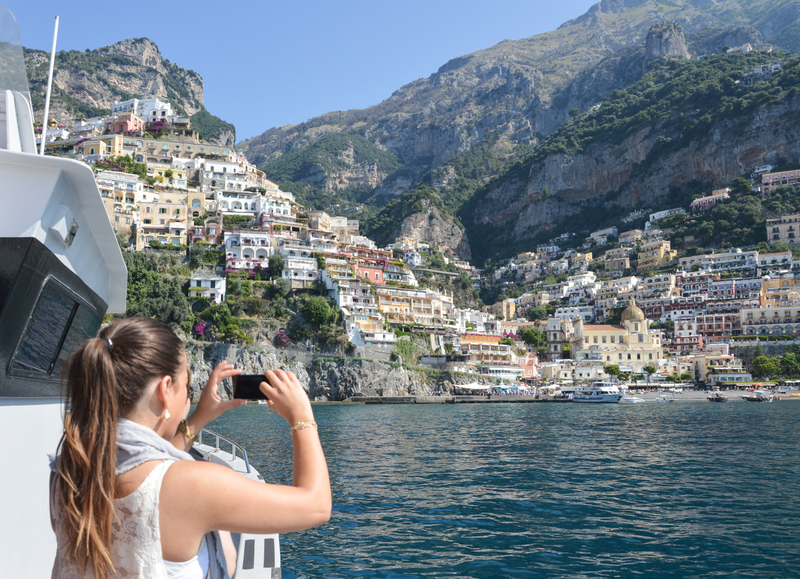 Travelmar may be an option for day trips from Positano. Appreciate your response – thanks! Hi Brenda, That sounds like a great plan! Yes, Travelmar is definitely a good option from Positano. There’s also a bus from Sorrento to Positano as a back up if the ferry isn’t running. Always good to know! If we are staying in Positano Oct 6-8, and want to take the Walk of the Gods hike on Oct 7 (not too early though!) back to Positano. Should we take the morning ferry from Positano to Amalfi , then I guess the bus to Bomerano? Or is it better to take a bus from Positano to amalfi then the second bus to Bomerano? If we take the ferry, will it be easy to fnd that second bus? I thought the ferry would be a nice start to our first day there after arriving the night before. The ferry might be 5 e more per person but maybe will be nice sightseeing? Hi Jane, I’m sorry I missed your comment! I think that would be the best way to do the Walk of the Gods from Positano. I hope it all worked out smoothly and you had an incredible time on the Amalfi Coast! Hi, can you tell me if it is possible to get a ferry from Naples to Amalfi.